This was my first Christmas away from home. Beforehand I hadn’t felt too good about this. Hours were spent googling for cheap flights; Christmas themed advertisements and TV Programmes were making me emotional (one christmas episode of Modern Family left me depressed for about 4 hours) and any mention of Colombian Christmas traditions just made me yearn for the usual fighting over tree decorations, Christmas eve mass and getting up at ridiculous o’clock to see what Santa had brought. Nonetheless it turned out to be an awesome time, and the beginning of a coastal adventure that I will remember as one of the best experiences in my life. I arrived a few days before Christmas and had a nice catch up with the other British Council assistants. We spent days on the beach, walking around the beautiful historic centre and finding out what everyone had been up to. This was definitely the most unique Christmas Eves I’ve ever had. Early in the morning we got up and headed off to the Mud Volcano found between Barranquilla and Cartagena. Along the bus journey we played great games… Which some of us were better at than others (“Is it a type of winged bird?”, “Twilight?” inside jokes). Finally we got to the volcano. We stripped off into our bathing costumes and headed up the steep, slippery steps to the top. It was quite funny watching people slide in and get their massage from the men inside. For some reason, I was the first from my group to get in (unusual as I’m not particularly fond of being touched up and rubbed by Colombian men… But hey, when in Rome! ), and it was super weird. Expecting to put my feet on the ground, I was yelling and squealing as I kind of floated in the thick liquid… A man pushed me over to the side and I got my massage as everyone else laughed at my high pitched howls. I didn’t know if I liked it or not… But after deciding it was how I would feel swimming in custard I let my hair down and started to enjoy the experience. Moving in the mud was really hard… I tried to turn around, but my legs were pulled upwards and the force of the mud nearly took out a whole family of Colombian tourists. Instead I decided to rely on asking strangers to push me about so I could move over beside my amigos. Once out, we made the short walk down to the river to bathe and get the mud off us. 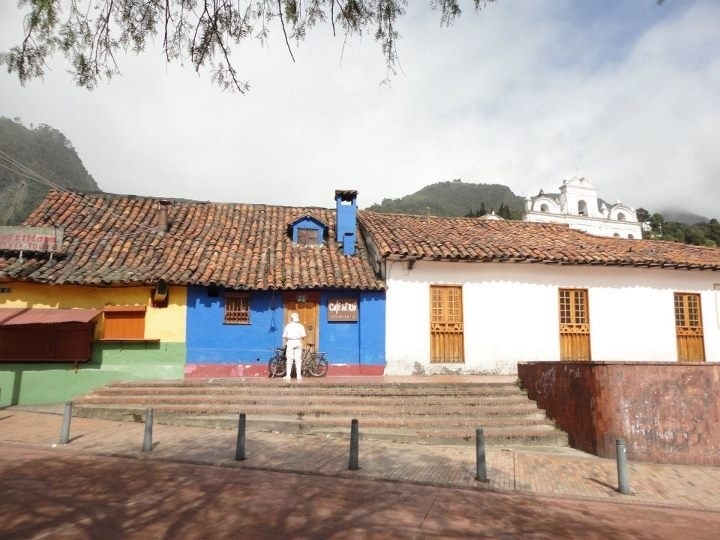 We were herded up by Colombian women who sat us down, stripped us bare and washed us and our clothes. This might sound exciting, but unfortunately these women weren’t like Shakira or Sofia Vergara- more like their grannies! Back to Cartagena we had a relaxing night- I went off to find a mass, failed at that and after a quick prayer was asked to leave a church because they were closing. I didn’t even know churches closed! On Christmas morning I got up and skyped my family. I talked with them through Christmas dinner and they told me all about what they’d got up to, and I told them about my mud volcano adventure. I was really glad to speak to them- as beforehand I was a bit depressed, blue and gloomy despite my beautiful Caribbean surroundings. I even introduced them to Heather- who my family were very fond of. Heather even got shown the dog. It was cool for Heather to meet them- as when I was not enjoying my time in Colombia and wanted to come home, she encouraged me to stay and stick with it- which looking back was obvs the right decision! We headed off to the beach, lay about in the sand and played volleyball in the water. 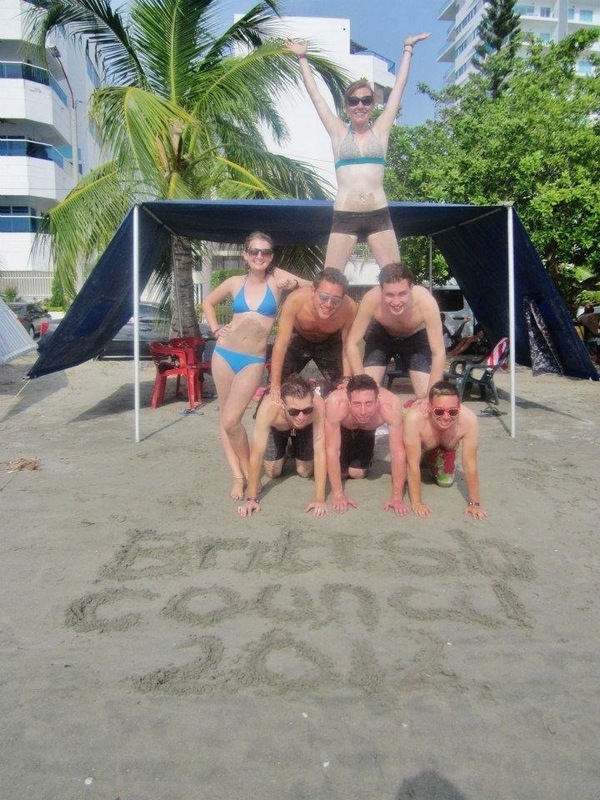 We even made a big human pyramid of the BC assistants, and planned to send our photo off to the language assistants coordinator, Katie Potts. 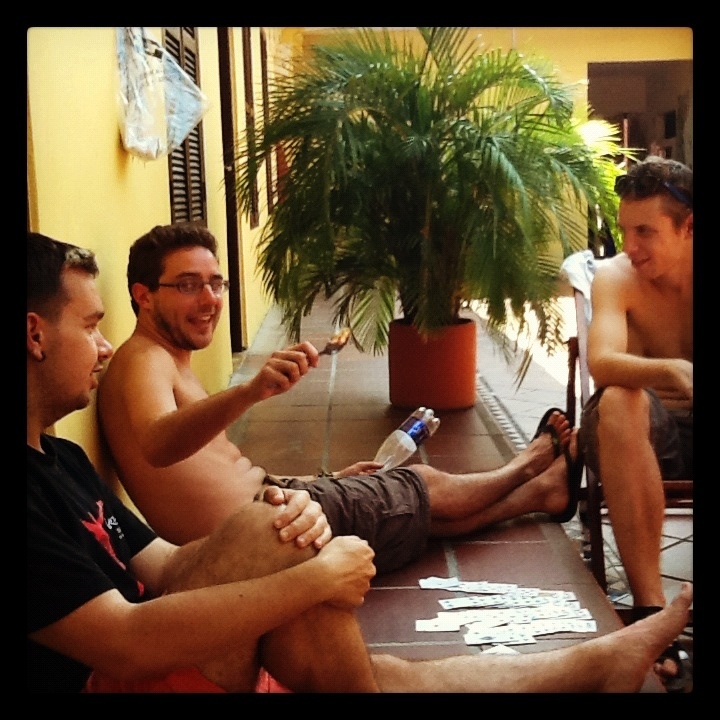 We returned to the hostel and began to plan our Christmas dinner. Heather, Alex and I set off to the exito (supermarket) and began our search for the ingredients. This had to be the most stressful shop of my life. We had no idea how much food to buy, budgeting was a nightmare and finding a vegetarian option for Tamsin (who also has a soya and nut allergy) was a total pickle. In the end we got way too much food, but came in under budget- shwing!!! Finding Tamsin a veggie option was really difficult. “What do you stuff a pepper with?” was asked to a few shoppers, before we decided to phone executive chef Ryan to consult him. I can’t quite remember what the final result was, but Tamsin thought it was JAMAZING. 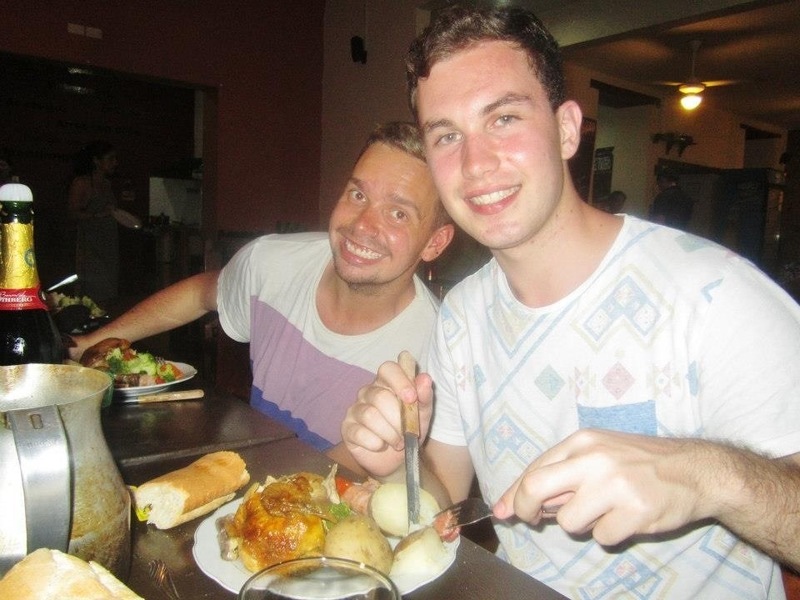 Back to the hostel, Ryan was the head chef while a few helpers chipped in too. Heather, Alex and I had a well deserved rest while awaiting our spectacular Christmas dinner. We all sat round; shared the wine, gravy and veg and a had an amazing Christmas dinner, it was delicious! Afterwards we all went round and said something nice about our time, and I was super happy to have such cool people to spend this important day with. Christmas Breakfast! I haven’t had a fry on Christmas day… But this one cooked up by the lads really did the trick! Wonderful Christmas gifts from Rose- thank you! A part of the secret Santa game we did. 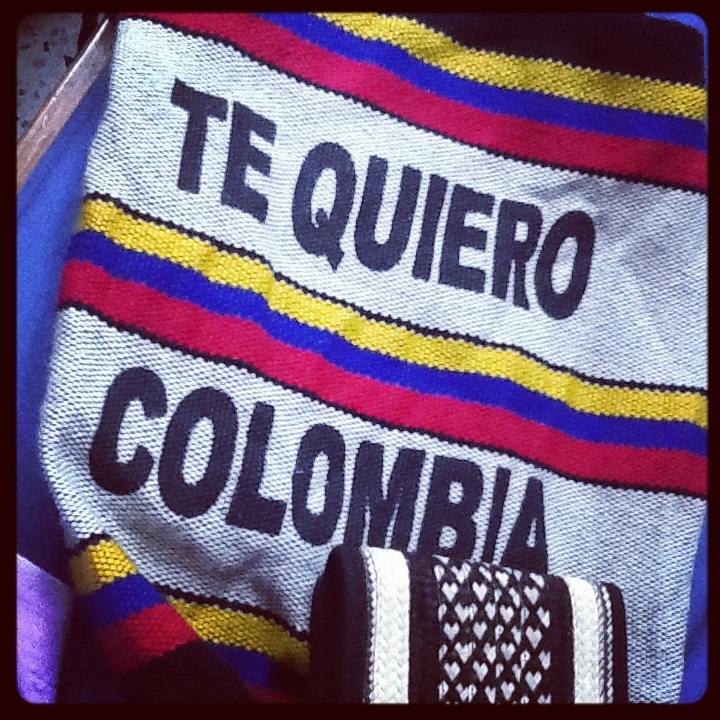 Buñuelo Colombiano. 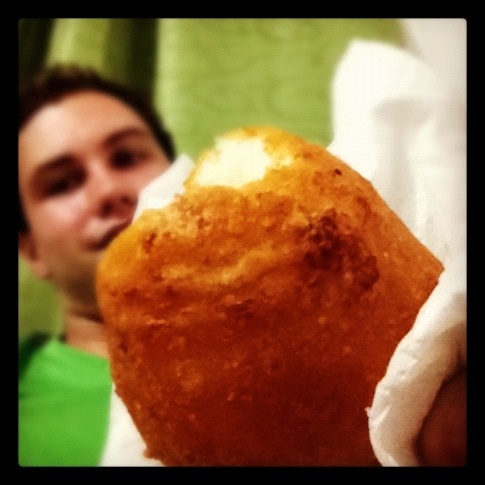 Popular around the hispanaphone world, but here in Colombia it’s basically a dough ball. Usually eaten at Christmas, and I think they’re delicious! 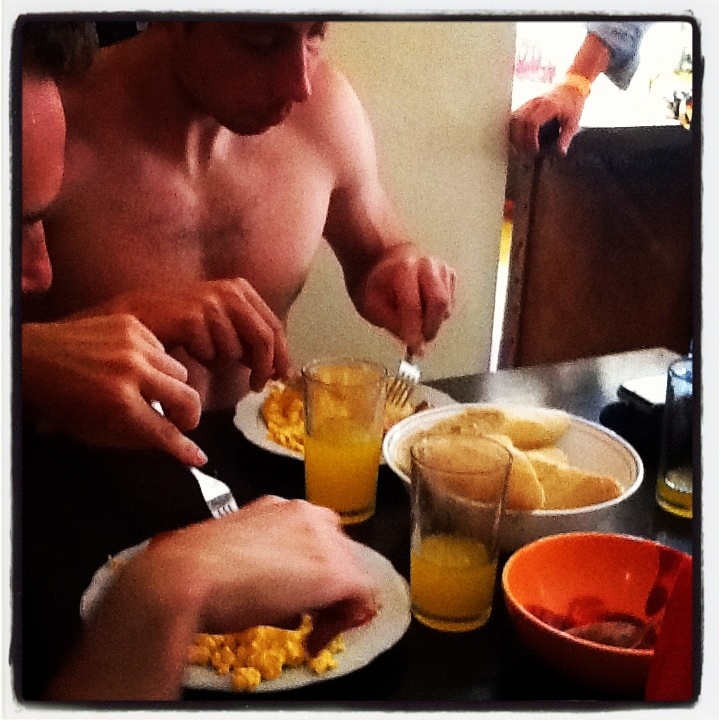 Ps… Just found out they have eggs and cheese in them- I can’t believe I like them!